‘You demonstrated that you are a cold executioner. 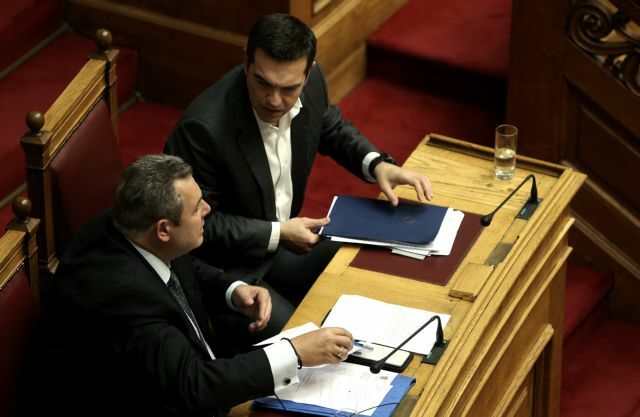 Obviously for you executing us means nothing, but for us the execution of Macedonia means a lot,’ Kammenos told the PM. Prime Minister Alexis Tsipras and his former junior coalition partner, Independent Greeks leader Panos Kammenos, ripped into each other during the debate on the ratification of the newly renamed North Macedonia’s Nato accession protocol. “You demonstrated that you are a cold executioner. Obviously for you executing us means nothing, but for us the execution of Macedonia means a lot. I am not threatening you with anything. I am telling you to at least have the sensitivity to respect principles and ideas since you do not respect human relationships. I may follow the path of those whom you decommissioned and return to my home,” Kammenos declared in an unprecedented attack on the PM. The attacks came even as Kammenos’ Independent Greeks Party lost the status of a parliamentary party (which requires five MPs) as some of his MPs defected and backed SYRIZA on the Prespa Agreement and on the protocol admitting the newly renamed Republic of Northern Macedonia to Nato. Kammenos and New Democracy have accused MPs from other parties who backed Tsipras and SYRIZA as sell outs who traded their vote for position and rank or a place on SYRIZA’s electoral ticket. “Where will those who come after us go, all those young people who believed that there can be a government of national reconciliation? I have battled corrupt vested interests for 25 years. Four newspapers were founded by a particular individual that put have been putting me on their front page until today. I clashed politically, and you tell me that I cut a deal. No Mr. Prime Minister, I did not cut a deal and I shall not,” he added. Some analysts and pundits believe that the political divorce between Tsipras and Kammenos is a charade and that the public and vitriolic mutual recriminations are designed to conceal that and to boost Kammenos in his seemingly impossible (based on opinion polls) effort to rally his right-wing audience so as to pass the three percent threshold for a political party to enter Parliament. The Independent Greeks drawing votes from New Democracy’s right-wing base and entering Parliament is considered a factor that could deprive Kyriakos Mitsotakis of a prospective absolute parliamentary majority. The PM immediately picked up the gauntlet and lashed out at his former coalition partner. “I am not here to follow the efforts that have been exerted over the last days. I must confess that I am unable to understand the intensive effort that you have been making to dismantle and annul a substantial part of your political history of the last four years, which is the positive part,” Tsipras said. “In your speech you said four times that you have not laid down a bridge to corrupt vested interests or to New Democracy.I shall not try to unravel what that might mean psychoanalytically. What will remain in history are the positive things that you did over the last four years,” Tsipras said. I assure you that in the future you will be grateful to me for discovering in a timely manner your political plan to topple the government, which you supported for four years, over a crucial national issue. 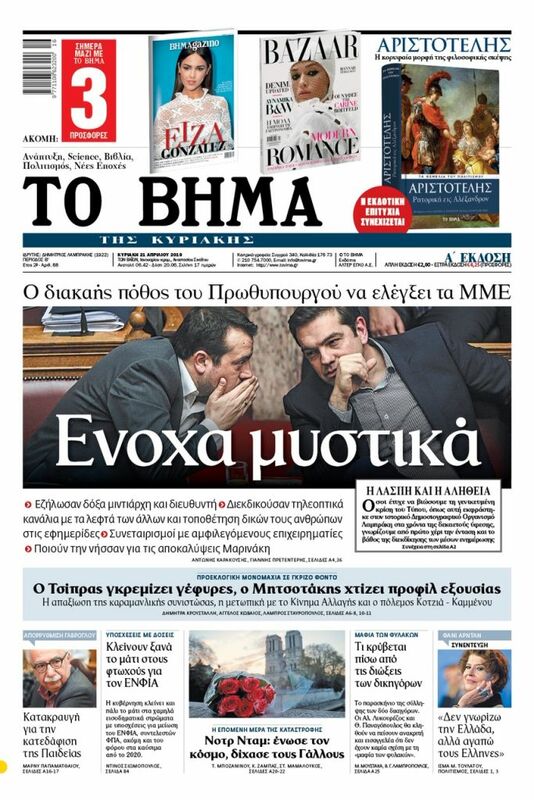 You will be grateful to me for averting your being recorded in history as a new Antonis Samaras,”Tsipras declared. He was referring to the former New Democracy leader Samaras’ role in toppling the government of Constantine Mitsotakis, whose foreign minister he was, over the Macedonian naming issue in September, 1993.